Little Pickle Press, 9780984080687, 32pp. More Awards for What Does It Mean to Be Present? Author Bio: Rana DiOrio was born in Providence, RI and grew up in a colorful Italian-American family. Her curiosity about the world began in kindergarten, while studying Western access to China and, obviously, panda bears. As a political science major/psychology minor in college, and then as a law student, she became fascinated with understanding perspective, and how just about any person, place, thing, or situation can be interpreted in so many valid ways. I believe that I have two ears, two eyes and one mouth intentionally, so I listen and observe more than I talk, she explains. As a result, I think I m better able to respect and appreciate diversity. Rana s inspiration for writing What Does It Mean To Be Global? was the election of President Barack Obama and explaining its significance, on so many levels, to her children. 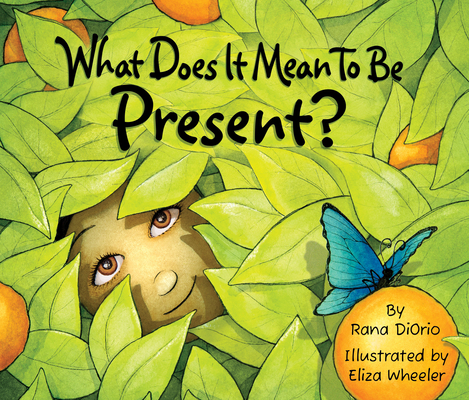 Rana has written her way through life as a student, a lawyer, an investment banker, a private equity investor, and now as an author and publisher of children s picture books. Her interests include practicing yoga, reading non-fiction, dreaming, effecting positive change, and, of course, being global, green, and present. She lives in Tiburon, California with her three Little Pickles. Illustrator Bio: Eliza Wheeler, was born into a family of musicians, artists, and teachers, and was raised in the north woods of Wisconsin. As a toddler, she adored crayons, and drawing has been her favorite creative outlet ever since. Eliza received her BFA in Graphic Design at the University of Wisconsin-Stout; shortly thereafter, she abandoned the mouse and embraced pen on paper to pursue a career in illustration. She began studying illustration in earnest and fell in love all over again with the picture books of her childhood. Now, Eliza has found her true calling illustrating for the children's book market and creating illustrated gifts for her online gallery.While illustrating What Does It Mean To Be Present?, Eliza reflected upon her life experiences of being present: as a young girl, swimming in the Brule River and picking blueberries with her grandma; as a teen, running on long country roads; and today, hiking in the Hollywood Hills and walking to the farmer's market. Eliza's interests include camping, reading, listening to music, and appreciating art. She and her husband live in Los Angeles, ""like two peas in a pod."" "